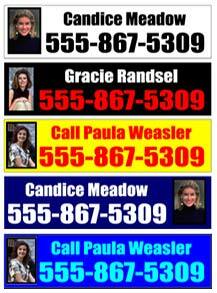 Real Estate Rider Signs | Agent Name Signs from $4.90 ea. Starting at 4.90 per sign, our sign riders are a perfect compliment for existing yard signs. They measure 24 inches by 6 inches and universally fit into any standard real estate signage. We have single color riders that come in many colors and fonts as well as full color sign riders. Both types can be ordered in both single & double sided configurations. To get started, pease Select Single Color Rider Signs or Full Color Photo Sign Riders. Our easy step by step order form allows you to add text, colors and type styles. Please view our ordering instructions or place an order. If you would like to place a large order and would like to see if you qualify for quantity discounts, please email us your request. 1. Select the type of rider sign you would like to purchase. 4.Select the font you would like for the text. 6. Enter the second line of text. 7. Click on the Add to Cart Button to Check out. A proof of the design for your real estate riders will be generated for you to preview or make changes to. The preview of your sign riders will be sent as an attachment to your e-mail address within 24 hours. You can also enter special instructions you may have regarding the layout of your sign riders on the next page. Our rider signs are perfect for the realtor on the go. They measure 24"x6" and come in two different substrates. You can add your company logo or photo to any sign for an additional fee. Listed for sale are some of the most common types of real estate rider signs that we sell online. Our easy step by step order form allows you to add text, colors and text styles. Please view our ordering instructions or place an order. All orders are shipped out within 24 hours or artwork approval. If you would like to place a large order and would like to see if you qualify for quantity discounts, please email us your request. After you place your order, please email your photo to info@accent-graphic.com and we will insert the photo or logo into the layout and generate a proof of the design for your real estate riders for you to preview or make changes to. The preview of your sign riders will be sent as an attachment to your e-mail address within 24 hours. You can also enter special instructions you may have regarding the layout of your sign riders on the next page. Our rider signs are perfect for the realtor on the go. They measure 24"x6" and come in two different substrates.